Exceptional vintage 1950s retro style diamond cluster cocktail ring with a vivid cornflower Royal blue Burma (Myanmar) sapphire centerpiece, being NATURAL and UNHEATED / UNTREATED. 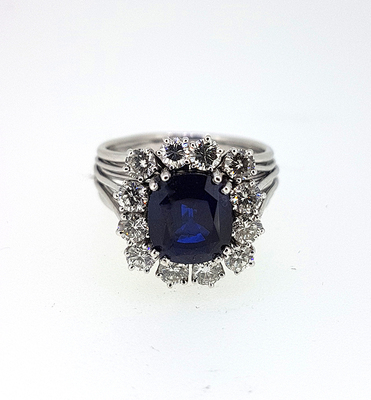 The cushion cut sapphire weighs exactly 3.38 carats measuring 8.85x7.90x5.03mm. The gem is fully transparent, eye clean and possesses a great clarity for a Type II gemstone. Under microscope observations there are a couple of internal crystal formations and inclusions and rutile needles that are a proof of the sapphire being natural and are the usual type that one finds primarily in natural untreated Burmese sapphires. There are further gemological evidences the sapphire is exactly of Burmese origin, including so called "fingerprints" or "healed feathers" from the natural crystal regrowth that primarily appears in Burma sapphires. The present Burmese sapphire was found to be not treated or heated since treated sapphires usually exhibit halo formations around the microscopic inclusions within the crystal, while the present sapphire does not show any such formations. The sapphire shows NO fluorescence whatsoever under UV light. The sapphire was inspected by a HRD certified gemologist and verbally concluded to be as stated. Upon additional request we can issue our company's COA report. A natural and unheated Burma sapphire of that quality and size is usually considered a rarity and particularly with such a vivid midnight blue color. The usual dealer's price for such a piece of that size is in the $8,500-$10,000 per carat range or $28,700-$33,800 for that particular stone. Apart from the prong set sapphire centerpiece, there is further a cluster of 12 round brilliant cut diamonds surrounding it. All diamonds are perfect E-F color and VVS clarity, each one having a diameter of about 3.0mm or about 0.10 carat each in terms of weight. Total estimated diamond weight is approximately 1.20 carats. The ring is made of platinum and gross weight is 11.4 grams. Ring size is 54 (US size 7 / UK size N), but can be resized. The ring is a vintage retro fashion piece from around the 1950s. Absolutely scarce vintage estate jewelry collector piece and one of the rare Burmese sapphire rings and jewels.